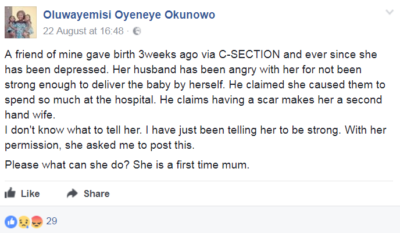 Facebook user, Oluwayemisi Oyeneye Okunowo shared this story of her friend’s husband who has been angry with her for having their baby via C-section and not natural birth. A friend of mine gave birth 3weeks ago via C-SECTION and ever since she has been depressed. Her husband has been angry with her for not been strong enough to deliver the baby by herself. He claimed she caused them to spend so much at the hospital. He claims having a scar makes her a second hand wife. I don’t know what to tell her. I have just been telling her to be strong. With her permission, she asked me to post this. 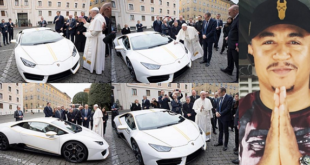 Please what can she do? She is a first time mum.